Click on the cover art to buy the book. Hurrah, I too have placed an order. Finally it has come to this – I am forced to make 2 comments – and about the other book too…this one looks good but I haven’t finished frightening people on the tube with my reading of the cormorants yet. You are still wrong about the buttoning and the unbuttoning and thats that. And your writings are the only sensible thing to do with the English language, nowadays. And thats all your getting out of me, today. I don’t feel wordfuggled; I feel gack – reply to my email please. THAT WAS IT! I ALMOST LOST IT! I SHALL HAVE to keep other things quiet or i shall forget. I am prone to forgetting. ” All those books you have read, regretting the way that you could not stop reading aloud in your head, never quite connecting with the adventures of Pip, or Mrs Haversham, or The Everley Brothers- always detached, never engaged with being terribly manipulated, or doing terrible manipulations, or the travails of the music industry- Always distracted by the parade of words before you. Sadly no record remains of how this review ended remain. Such are the corruptions of time and memory. Frank, that woman on the cover resembles my grand mother. Not just her surly and adamant, even grumpily expectant, expression but also her dress and weaponry. Whence does it hail? The title would not be amiss either, as you know Iran has the highest amount of drug users per person than any other country in the world, and the drug they love taking – opium, it’s quite a social norm – would easily induce a state in which “Unspeakable Desolation Pouring Down From The Stars” was an everyday truth! 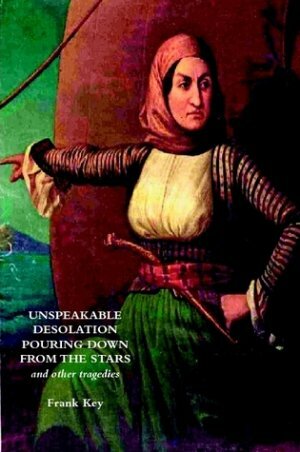 Fari : The woman on the cover (wholly irrelevant to the book, by the way) is Bouboulina Laskarina, a “celebrated heroine of the sea and one of the most famous figures in Greek history”. What is Bouboulina doing on the cover of such a book?? As a Greek I find that rather disrespectful. Margarita : Why on earth is it in any way disrespectful?